Witching Hour, also known as the Period of Purple Crying, can easily be described as one of the most difficult parts of having a newborn. It can last for several hours and occur every day, for weeks or months. It is a heartbreaking, stressful time but there is a light at the end of the tunnel. Baby may resist soothing and seem like they are in pain, however this is just a normal developmental phase. There are a few helpful tips for coping with the difficult time. 1. Be Prepared. Know that it is going to happen and that there is no way to change that. Accept that it will be a part of your life, but know that there is hope and it will end. Try to get some food and rest in before it starts. After a few days you will notice a pattern of when your baby's witching hour(s) occur. It's a good idea to get yourself a pair of headphones and maybe even a glass of wine. 2. Take a Break. 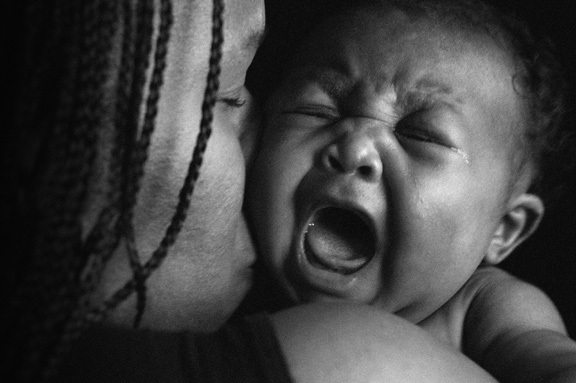 Hearing your baby cry can break your heart and stress you out. If you feel yourself getting too stressed, it is okay to take a break. Put the baby in a safe place, such as his or her crib, and step into another room. Take some deep breaths and when you feel that you've calmed down enough, go back to soothing your baby. Sometimes a little break or alone time is all the baby needs and can actually help soothe them too. 3. Babywear. Babywearing has numerous benefits, including, sometimes soothing babies to sleep. If baby simply cannot be soothed at the time, it will also give you a way of providing comfort for your baby, keeping them close to your body, and still being able to do tasks around the house. 4. Try Different Soothing Techniques. There are a number of different ways to soothe a baby, and some may respond better to different techniques than others. Some things you could try: nursing, babywearing, rocking, swaying, bouncing, walking, changing scenery, going to a dark quite room, getting outside, going for a drive, white noise, singing, shushing, taking a bath, doing skin to skin etc. Once you find something that works, keep doing it, until baby falls asleep or it no longer works. Don't change it up or switch arms or try to take a break, or else you risk starting up the crying again. 5. Get Help. Getting through witching hour is incredible difficult for one person, especially if it lasts several hours. It can be extremely draining. One way to cope is to have your partner, a family member or even a friend who can help out. Taking shifts gives the other person time to recharge and de-stress before taking back over.